Treat your mom (+ yourself!) 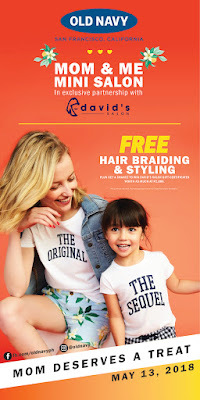 to a Mom & Me Mini Salon this May 13, 2018 at Old Navy for FREE Hair Braiding & Styling by David's Salon! Plus, enjoy Buy 1 Get 1 on all Women's Clearance items. Available in all Old Navy stores. Don't miss out!